Coming up this weekend at the Barclays Center in Brooklyn, NY boxing fans will witness an intriguing match up between two men at different stages in their career. Cincinnati's Adrien Broner (33-2, 24 KOs) will meet the undefeated Mikey Garcia (36-0, 30 KOs) in a 12-round non-title bout for a chance at bigger money fights in the future. For Garcia, there is less on the line as a loss to Broner can be brushed off as a venture to a new weight class against the wrong opponent stylistically. Although with Garcia being the favorite going into the fight with odds starting off as high as five to one in his favor, a loss would bring Garcia down a few notches in the overall pound-for-pound discussion. The lightweight division, however, will still be there for Garcia after the Broner fight. Broner, on the other hand, the fight with Garcia is a chance to get back into the consciousness of the elite in the sport. A loss may send him further down the totem pole and possibly relegate him to an undercard act rather than a main event player. Broner is a four-division world champion at just 27 years of age, but even with that success, most don’t feel he has lived up to his potential. At this point, Broner has made the same mistakes over and over leaving many to believe that this may be the level that he was meant to be at. No one would mistake Broner for being Pernel Whitaker (40-4-1, 17 KOs), Roberto Duran (103-16, 70 KOs), and Roy Jones Jr. (65-9, 47 KOs) concerning overall stature as a four-division champion. Looking at whom he fought to become a four-division world champion may give us a better idea of how he will perform against Garcia. In November 2011, Broner picked up his first world title when he faced Vicente Rodriguez for the vacant WBO 130-pound championship. Rodriguez at the time was widely unknown and was making his American debut after a career mostly fought in his native Argentina. The fighter considered to be the best in the division at the time was Japan’s Takashi Uchiyama (24-2-1, 20 KOs) who would go on to make 11 title defenses of his WBA 130-pound championship until he lost the title in 2016. Needless to say at 130-pounds this was the easiest road to a world title for Broner. However, it has been done before. For example, Oscar De La Hoya moved down to 130-pounds to meet Jimmie Bredahl (26-3, 7 KOs) for the WBO championship to make only one title defense and then move back up to the lightweight division. 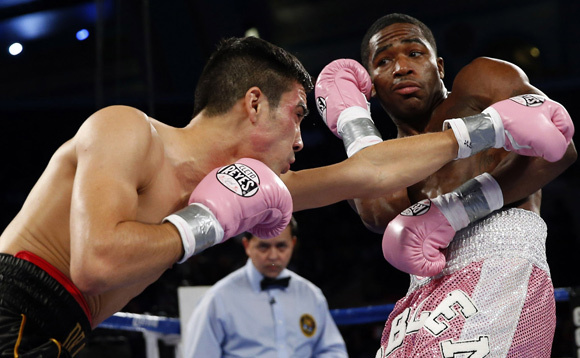 As expected, Broner would go on to defeat Rodriguez by knockout in the third round to win his first world title. The Cincinnati native would make one title defense against Eloy Perez (23-1-2, 7 KOs) in February 2012 stopping him in the fourth round. Afterward, one of the first signs of Broner’s outside of the ring antics affecting his career inside the ring came against Vicente Escobedo (26-6, 15 KOs). Broner was unable to make the contracted weight for the bout and lost his championship on the scale. Luckily Broner had better luck inside the ring and got the technical knockout victory with a fifth round stoppage. Before the fight, Broner tweeted out pictures of food including sweets that he was claiming he was able to eat before he failed to make weight. This would not be the last time Broner would fall victim to his own jokes. While there was much left to be desired at 130-pounds, the move to lightweight has been the highlight of Broner’s career thus far. Broner would face Antonio DeMarco for the WBC lightweight championship providing him with what many consider to be the best performance of his career. DeMarco was coming off of an impressive string of victories including three stoppages in a row over Miguel Roman (57-12, 44 KOs), John Molina Jr. (29-7, 23 KOs) and an impressive 11th-round stoppage over current WBA lightweight champion Jorge Linares (42-3, 27 KOs). While Broner was the favorite going into the fight with DeMarco his performance that night in November 2012 was extraordinary. Broner was so dominant in defeating DeMarco that many felt that the comparison’s made to Floyd Mayweather were justified even pushing some like the Ring Magazine to include him in their pound-for-pound rankings. After DeMarco, Broner would once again make one title defense against Gavin Rees (38-4-1, 18 KOs) at the beginning of 2013. The now two-division champion would stop Rees in the fifth round before jumping up two weight classes to invade the welterweight division. Making a move to the welterweight division was a risky move for Broner to make in 2013. However, it was a move that would potentially reap him the most benefits financially. Broner would meet the loquacious WBA welterweight champion Paulie Malignaggi in a bout that is remembered more for its ugly foul-mouthed press conferences than the fight itself. Broner would win a close split decision over Malignaggi in a less than scintillating performance that was far tougher than anyone expected. Hindsight being 20-20 this would be the beginning of a shift in Broner’s career. Next up for Broner was Argentinean slugger Marcos Maidana (35-5, 31 KOs). That faithful night in December 2013 was the first time Broner tasted defeat as a professional losing a wide unanimous decision in a fight where he was knocked down twice and generally beat up. At this point, Broner’s unapologetic bravado caused more fans to want to see him lose than to see him win. Broner’s persona and actions outside of the ring caught up with him inside the ring, and he was now putting on mediocre and uninspired performances. He would win three fights in a row in the Super Lightweight (140) division including an action fight with Emmanuel Taylor (20-5, 14 KOs). Broner’s next big fight came against Shawn Porter (27-2-1, 17 KOs) in June 2015 at a catch weight of 144-pounds. This may have been Broner’s poorest performance to date as he put his offense on layaway until the 12th round losing a wide unanimous decision. After the fight with Porter, Broner was lucky to be in position for another world title as he faced Khabib Allakhverdiev for the vacant WBA title at 140-pounds. By the time the two men faced off in October 2015, Allakhverdiev had been inactive for a year and a half having last fought Jessie Vargas (27-2, 10 KOs) in April 2014. The Russian fighter lost a close decision to Vargas in a fight that many had him winning. Regardless, Broner came into the fight with more focus and put on one of his better performances stopping the tough Allakhverdiev in the final round of the twelve round bout. Broner was now a four-division world champion at 25 years of age. However old habits came back into the picture. Broner would once again lose his title on the scale when he faced Ashley Theophane (40-7-1, 11 KOs) in April 2016. While Broner was able to stop Theophane in the ninth round, it seemed that all of Broner’s outside distractions were overtaking his career. With two vacant titles, two title-defenses and not having unified any of the titles in any division, Broner’s four-division Championships leave much to be desired. Only at lightweight did Broner face the best the division had to offer. The young champion may be too small for the welterweight division but unable to make the 140-pound limit at Super Lightweight. Broner has put himself in a position where his talks of finally being focused aren’t taken seriously by boxing fans. It is up to him to finally show us rather than tell us how serious he is taking his boxing career. The fight with Garcia this weekend is bigger than any title for Broner. If he can pull off the victory, it will be the biggest win of his career. The title belts are necessary in the boxing landscape to land you potential big fights, but in Broner’s case, the most important aspect will be his willingness to give a 100 percent effort win or lose.